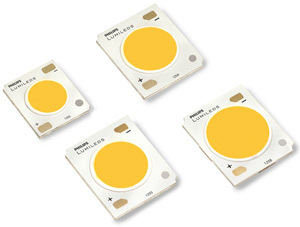 Cree, Philips Lumileds, and Toshiba all announced emitters this week. They have in common high efficacy, in the range of 130 lumens per watt. 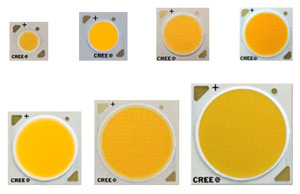 The news from Cree involved an extended XLamp CXA family with an LED array 68 percent brighter than before. Lumileds announced more efficient Luxeon CoB arrays. And Toshiba was touting a second generation of the GaN-on-Si process it acquired from Bridgelux, claiming efficacies that near those of the leaders in GaN-on-sapphire. Cree CXA LED arrays from 6mm to 30mm. Cree's XLamp CXA family of LED arrays has been extended at the top end to emitters that produce as many as 18,000 lumens of white light. 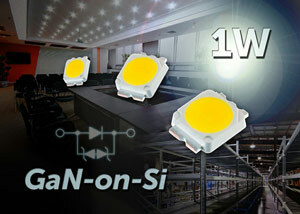 Light-emitting surfaces range from 6mm to 30mm, and input power ranges from 11 to 150 watts. The largest arrays are suitable for use in midbay and high-bay lighting, replacing metal halide fixtures of up to 250W. "The new high light-output LED arrays deliver up to 134 lumens-per-watt at 85°C [with] 70-95 CRI options," Cree said in a press release. As always, the highest efficacies are available in higher-CCT and lower-CRI versions. The sponsor of this site announced a 10 percent improvement in the performance of its Luxeon CoB array line, which was introduced only a few months back. The line now encompasses emitters from 1,000 to 7,000 lumens at an efficacy of up to 130 lm/W. In particular, the company says, "In warm white, the 9 mm array delivers 2200 lm at 100 lm/W and the cool white array delivers 2500 lm at 105 lm/W." Lumileds also highlights the Luxeon CoB's metal-core printed circuit board, which it says provides a 4x advantage in heat transfer over other solutions, enabling 40 percent smaller heat sinks. The arrays are available in minimum CRIs of 70, 80, and 90; the typical CRI of an array characterized as minimum-90 is stated as 97. The company announced the second generation (LETERAS TL1F2) of LEDs made with the GaN-on-Si process that Toshiba acquired from Bridgelux. The LEDs were produced on 200mm wafers; the ability to fabricate on larger wafers is one of the claimed advantages of GaN-on-Si. The 1W devices produce 104-135 lumens, according to Toshiba, in a CCT range from 2,700K to 6,500K and with a CRI of 70 or 80. Electronics Weekly reported that the claimed efficacy is in the range of what is being achieved by the best GaN-on-sapphire LEDs, as long as they are measured "hot" at 85°C. (It looks as if both the Cree and Lumileds products indeed are characterized at 85°C.) I haven't been able to find any product details yet on Toshiba's components site.